I discovered that our new (previously feral) kitten likes to sleep in the space behind my parts box! Ok, tonight I completed the wake re-do on the ocean base – it looks pretty much as it did before the disaster, but I’m now past the irritation and ready to go forward! 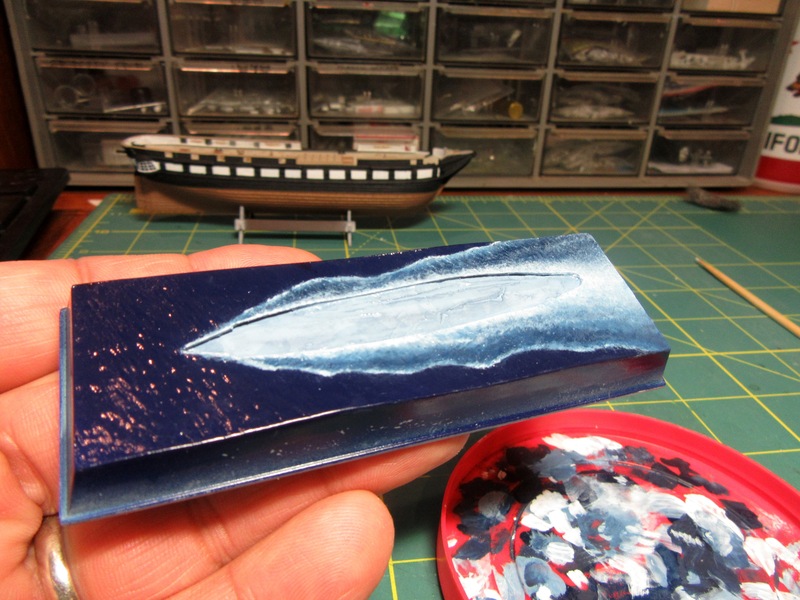 While it dries, I thought I’d get back to the ship. 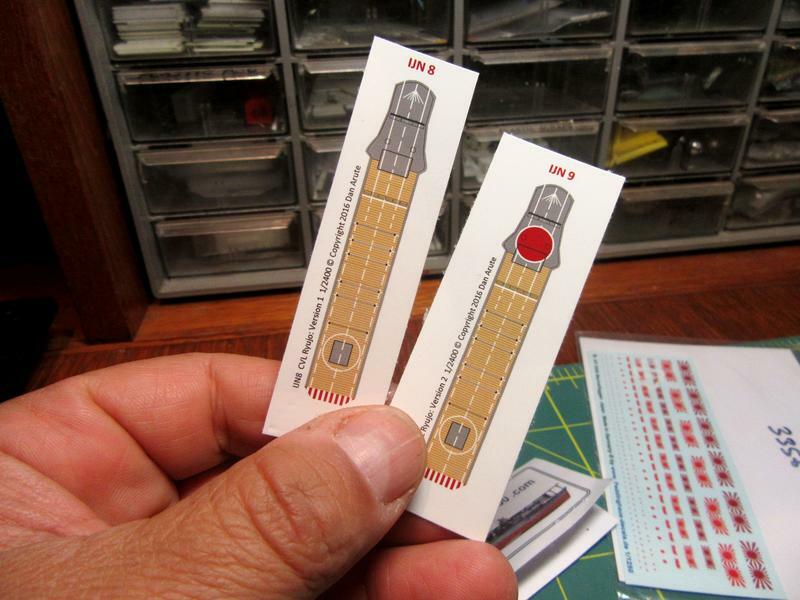 Painting the Ryujo’s flight deck with all those colors and markings would have been a challenge, but Dan Arute at Flight Deck Decals 2400 offers some absolutely beautiful decals for the flight decks of these tiny ships. There is even a choice in the case of Ryujo; either with or without the red Hinomaru “meatball” marking forward. Not much photographic evidence has survived, but we do know that the Hinomaru national marking was applied to Japanese navy carriers at the Battle of Midway in June, 1942. The practice was discontinued sometime after that – probably because the bright circles made such convenient aiming points for USN dive bombers! 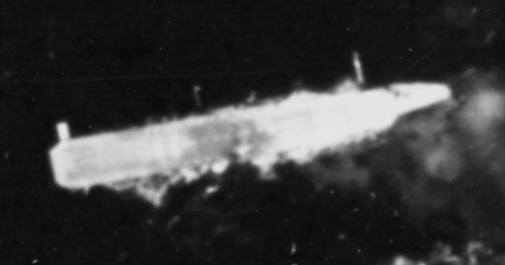 I couldn’t find any documentation that Ryujo carried the marking in the time period I want to depict, August 1942; the only overhead picture from that time was taken of the disabled ship from a B-17 about to attack it. The pic shows the dashed centerline marking, but the forward part of the vessel is obscured, so I guess it could go either way. I would too. The Guadalcanal Campaign where Ryyjo was lost is a special area of my interest, and I have never seen anything to suggest that any IJN carrier carried the Hinomaru markings during that campaign. In fact I am not all that confident that any Japanese carrier involved in the Midway campaign carried it either, except the four assigned to Carrier Divisions One and Two of Kido Butai. 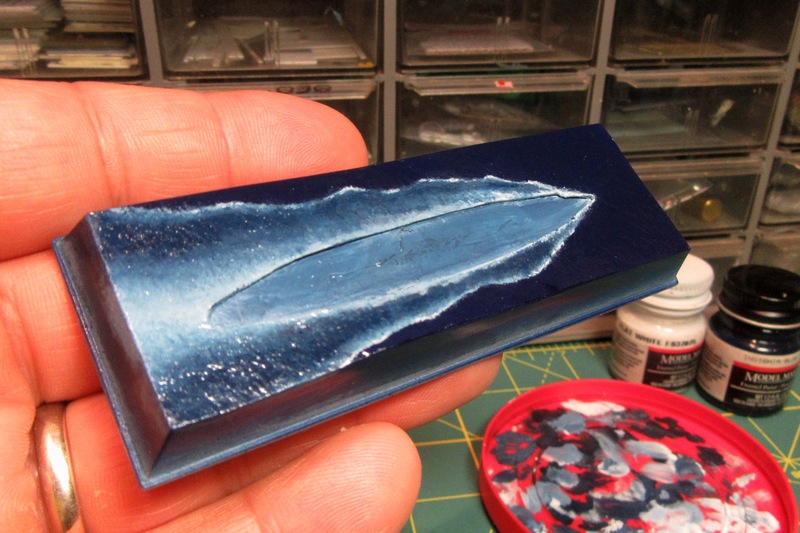 After a disastrous first attempt, I have repainted the Ryujo’s wake. As before, I used Model Master Flat white enamel with a bit of Insignia Blue over a cured base of Tamiya Royal Blue acrylic – but this time without the lacquer thinner! This was followed with a protective coat of Future (now known as Pledge ‘revive it’ floor gloss) acrylic. The sides were then shot with Tamiya Desert Yellow (XF-59) acrylic followed with a streaky coating of Winsor & Newton Burnt Sienna artist’s oil (with just a touch of Burnt Umber) to simulate the look of a wood base. Now back to the ship! I have always wondered how people get the hole to be as exact that no filler is needed. Super base now Tim! That one really looks super realistic. Maybe some dolpins jumping out of the water ahead of the ship? wake looks good, so does the wood effect. Mark, Thomas, and Si – thanks for your comments. 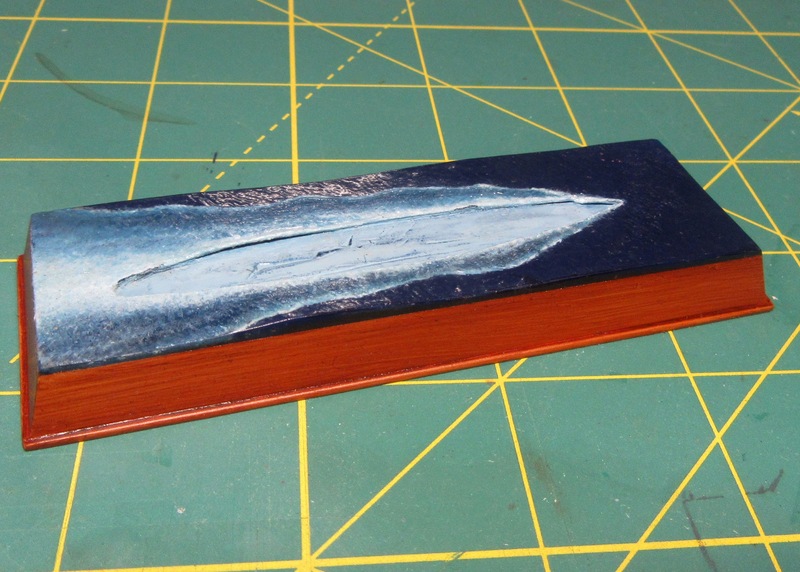 The painting of the wake was pretty straightforward, and the wood effect is a simple but effective hack. The toughest part is redoing work I’d already accomplished. As much as I love model building, I do hate re-work! Hi Karl. In this case it was simple. I just traced the outline of the ship on the paper with a pencil, cut it out with a hobby knife, and bonded the paper to the base. 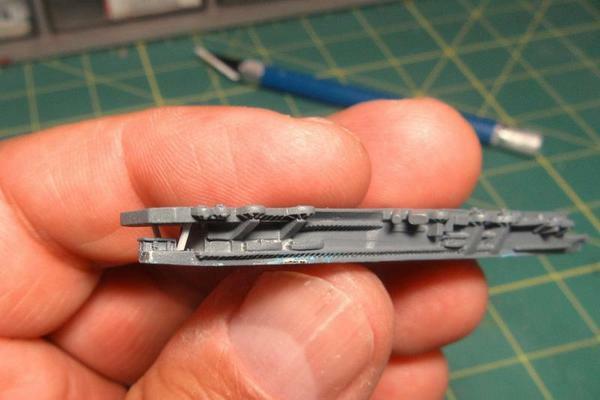 The GHQ kit had depicted the small raised deck aft along with the flight deck supports as a single solid piece; I used the deck but trimmed away the supports and replaced them with .020 X .020 inch plastic pieces. The supports won’t be highly visible in there, but they provide a better, more open look than the solid part. Opening up the stern like that will surely add depth. First - very nice recovery of the sea base, looks really fine! And good to see you are back working on her! Second - somehow I knew you would not be able to do one single model OOB - great approach and fantastic microscopic work!! Wow Tim. Great work in such a small scale! I doubt I could even see it! Si, Mark, Jan, Thomas, and Mark – thanks! This little carrier may be small, but the GHQ kit is excellent, an absolute pleasure to work with! I would too. 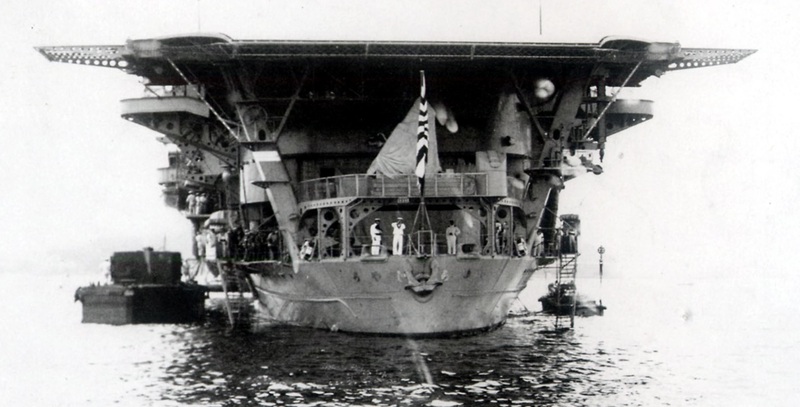 The Guadalcanal Campaign where Ryujo was lost is a special area of my interest, and I have never seen anything to suggest that any IJN carrier carried the Hinomaru markings during that campaign. Nor is there any indication of such an insignia in the Saratoga airgroup’s report on the attack (unlike the Enterprise and Yorktown airgroups' reports on the Akagi, Kaga, and Soryu strikes at Midway which specifically mentioned those ships’ distinctive flight deck markings). 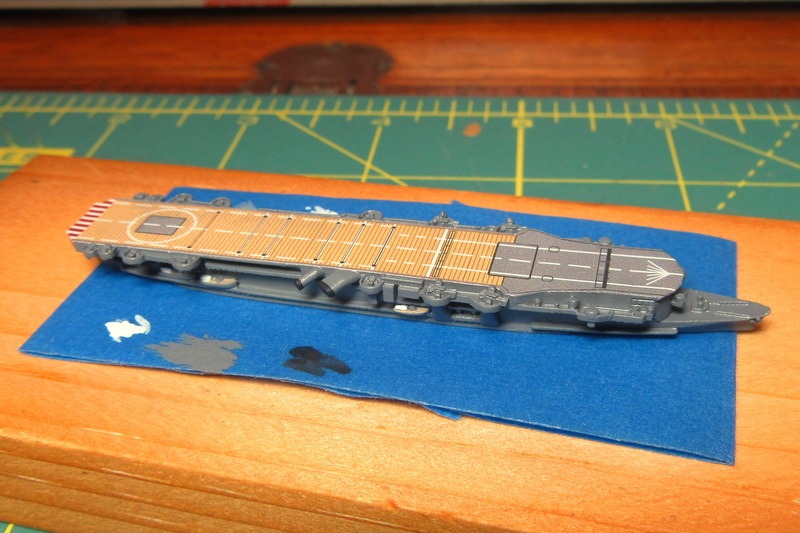 So I applied the unadorned version to the previously glossed flight deck. With the help of a little Micro Sol setting solution, the decal snuggled down beautifully into the scribed deck detail. 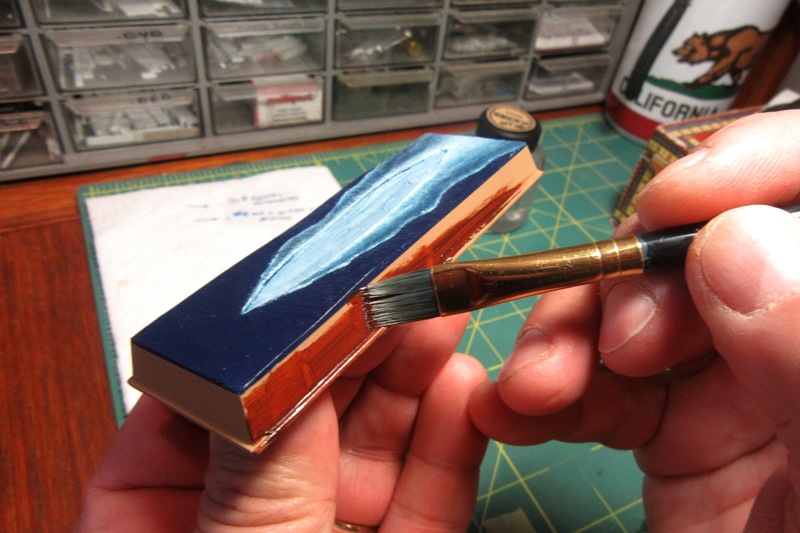 The end result is quite effective – and SO much easier than painting all this would have been! Those GHQ models are really the gold standard in that scale. That magnificent decal will definitely command most of the attention, but there are a few other details as well. 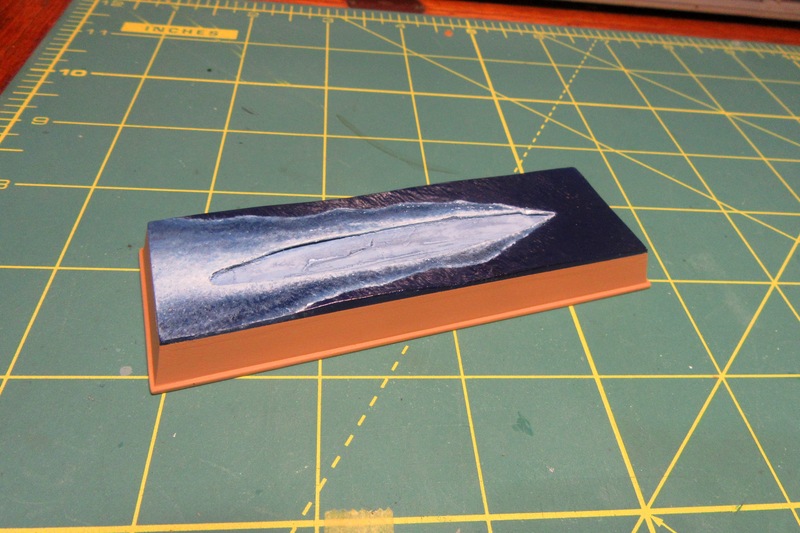 Temporarily taping the model to a small block of wood for ease of handling, I added the colors of the ship’s boats and funnels. She is really a sweet looking ship.